My son started his school this week and so far he is doing well. He loves going to school, meeting new friends and teacher and most of all is very excited to learn new things at school each day. Hubby and I are very impressed with him, Jacob for he wakes up early in the morning preparing himself by dressing himself up, and making sure that everything is in his backpack before leaving home. It's been four days now, and he still has the same excitement ever time he goes to school. I love that his school is just a walking distance from our home, there I don't need to drive him off to school or pick him up. He loves to go home without us picking him up..... for it make him feel independent, confident and boosts his self-esteem. Everyday, he learn new thing sand we are indeed also excited for him. 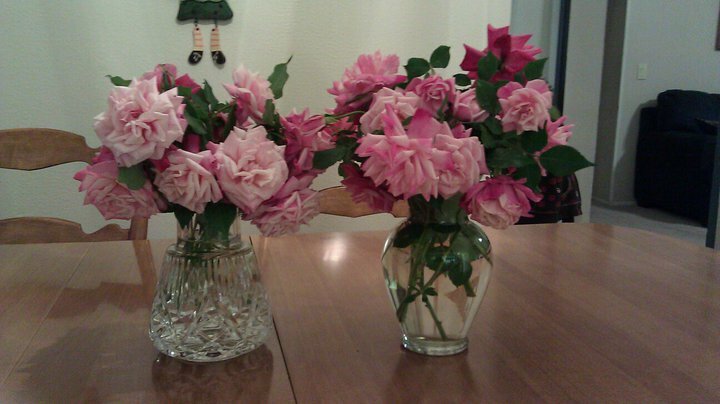 Joining this meme once again after a long absence :-); and here is my share: Roses from a friend's backyard! Aren't they pretty? Oh how I Love Roses, especially the pink ones :-)! Join us by clicking the badge below :-)! Top Tips for Removing Pet Odors – For Good! 1. The most important thing you need to do is treat the area right away. The odors and stains are easier to get rid of when they are fresh. You can start by absorbing as much of the liquid as you can, if it is a urine odor. 2. You should avoid using ammonia as a cleaner for the problem area. Ammonia sometimes smells similar to the pet odor and it will not deter the animal from re offending in the same spot. 3. Sprinkle the problem area with baking soda. Let it sit overnight and vacuum it in the morning. You may have to repeat this process 3 or 4 times, maybe more, before the smell is gone. If you are treating a carpet, sprinkle the entire carpet with baking soda making the coating much heavier in the problem spots. Again, repeat this until the smell is gone. 4. Vinegar is also effective in eliminating unwanted pet odors. Add 1 cup of white vinegar to the washing machine when you wash our pet’s bedding and blankets. Carpets and fabrics can be sprayed with 4:1 water to vinegar mixture for odor elimination. For a spot that has a strong odor you can soak the spot with the mixture then let it dry. The vinegar smell will go away shortly after the area is dry. 5. For a smelly litter box, sprinkle baking soda inside the box. Baking soda is natural and will not harm your cat. The baking soda will absorb the odor before it escapes. 6. Use Febreeze to freshen up fabrics, couches, carpets and anything else your pet may have been in contact with. 7. After you have cleaned the problem area, let it air dry. Avoid using a steam cleaner or a blow-dryer, heat will set the odor and stains. Once the odor is set, it makes the job of eliminating the odor almost impossible. If you can smell the odor but have no idea where it is coming from, use a black light to illuminate the problem area. You will have to shut the room lights off and turn on the black light. It will show the urine stains and you can mark them with a piece of chalk so you know where they are when you turn your lights back on. Hopefully this will have you in a fresh smelling and feeling home in no time.